We Be Reading: The Rise and Fall of D.O.D.O. 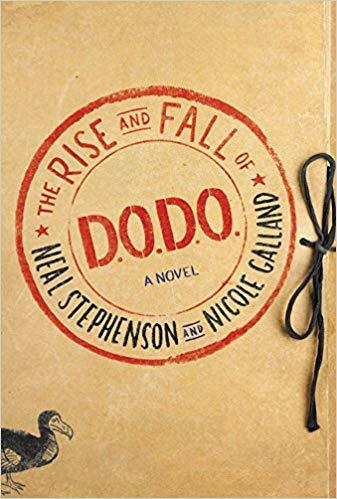 I don't think I've really seen this book mentioned much of anywhere since it was published last year (and was a NYT bestseller) so I just wanted to get The Rise and Fall of D.O.D.O. by Neal Stephenson and Nicole Galland back on the radar. I personally put it off for a while because it is like 750 pages long and I had no idea if it would be a slog. But then it was summer and, well, what else did I need to do but read a massive book that I only remembered picking up because it sounded like exactly my kind of story? It turns out that it was exactly what I needed to do. It was a perfect summer vacation read and was TOTALLY my kind of story (and it cleared a huge spot on my TBR shelf that fit like two or three new books). I flew through this tale of time travel and history and technology and witchcraft with eagerness and joy. This alternate history story is mostly told by Melisande Stokes, a story she rushes to get onto paper as she waits in 1851 for an unlikely miracle to get her back to the present day before she gets stuck in the past forever by the end of magic. Because, in this history, magic exists until some event in 1851 causes it to end, leaving witches powerless and the world irretrievably changed -- or is it?! Linguist Melisande is approached by Tristan Lyons (of the mysterious organization D.O.D.O.) and asked to translate specific historical documents in an attempt to find out what magic was and if it could possibly be restored. The rest of the book is part adventure, part moral tale, and all amazing. I love time travel and I love magic and I love science fiction tech and they all worked together so well in this book. I actually keep picking up time travel books this summer for some reason (and I haven't even gotten to To Say Nothing of the Dog yet!) and each leaves me thinking about something different. This one made me wonder what subtle nudges we could have given our society to be in a better place right now. Maybe convince Trump's dad to donate that first million to a worthy cause instead of giving it to his loser son? Who knows where we would be now.